The celebrated, Oscar-winning actress was brought up in Leigh-on-Sea and attended St. Bernard’s High School for Girls at Westcliff (as, some years earlier, did another of our alumni, Anne Stallybrass). She has always said that two performances she saw as a child in Southend – one aged six, a summer show Out of the Blue, at the end of the pier and the other, at the Palace Theatre, an amateur production of Hamlet by Southend Shakespeare Company in November 1957, when she was thirteen – were the inspirations behind her becoming an actress. Then, in November 2006, Miss Mirren made sure she called in at the Palace while she was in Southend filming a documentary in which she recalled her earliest memories. 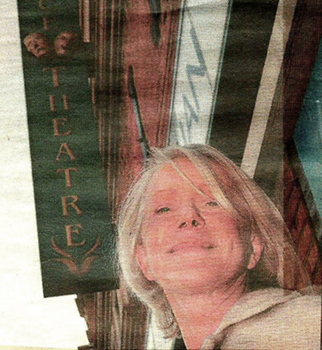 She said how excited she was to know the theatre would be re-opening later that month and happily posed for this photograph (scanned from an article in the Evening Echo). In 2012, Miss Mirren was also kind enough to write the foreword for the Centenary book, Tales from the Palace Theatre. This page was added by Ian Grant on 10/02/2014.